Cilantro is prized for its boldly flavored, aromatic leaves and its seeds, which are known as coriander. Cilantro is a cool season herb, so it thrives in pots indoors or in cooler areas of the garden. The leaves can be used until summer heat causes it to bolt and produce seeds. You can then save the seeds and grind them as a spice in the kitchen. Cilantro is usually grown as either a spring or fall herb, though in areas with mild winters it can be grown during the winter months. Prepare a full-sun, well-draining garden bed in early spring as soon as the soil can be worked. Lay a 2- to 4-inch layer of compost over the bed and till it in to the top 6 inches of soil to add nutrition and drainage to the bed. Sow seeds to a 1/2-inch depth and space them 2 inches apart in the row if you are just growing for leaves, or 8 inches apart if you will also be harvesting the coriander seeds. Space the rows 15 inches apart. Mist the soil surface with water to moisten it. Use a hose sprayer attachment to soften the water spray so the seeds aren't disturbed. Keep the soil moist at all times. Seeds germinate within three weeks. Fertilize the cilantro plants six weeks after planting. Use 1/4 cup of nitrogen fertilizer per 25 sq. ft. of bed. Work the fertilizer into the soil between the cilantro rows. Fertilize a second time at the same rate six weeks later. Lay a 2-inch layer of organic mulch around the cilantro when they are 4 inches tall. Mulching preserves soil moisture, maintains soil temperature and prevents weeds. Harvest cilantro leaves when they are approximately 6 inches long. 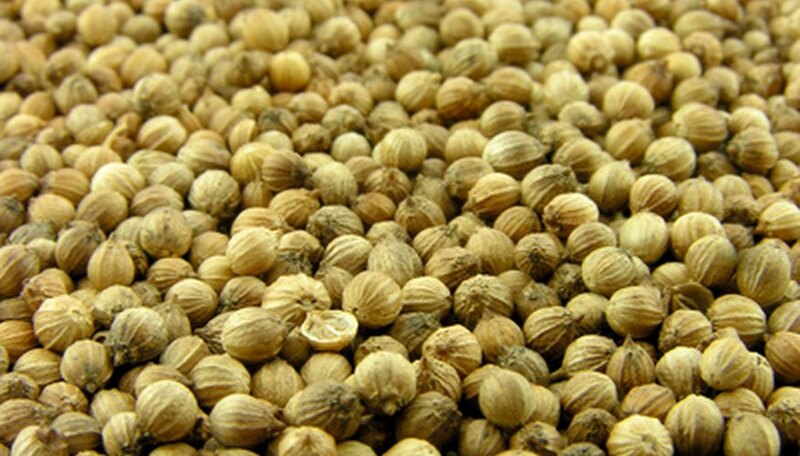 Harvest coriander seeds after the plant has flowered and begun to die. Remove the seed stalk and shake out the dried seeds. Start cilantro in a pot indoors in mid-winter to get a jump start on the gardening season. Cilantro needs temperatures below 75 degrees F to germinate. Planting too late in the summer will cause the seeds to rot in the ground. How Long Does It Take to Grow Chives? Is Cilantro a Perennial Herb?